Perfect bound, 116 pages , 5.5" x 8.5"
A police officer is questioning a suspect. The goal is a confession—or, at the least, information that will lead to solving the case. But often, the suspect doesn’t want to talk. What can the officer do then—within the law—to get the needed information? 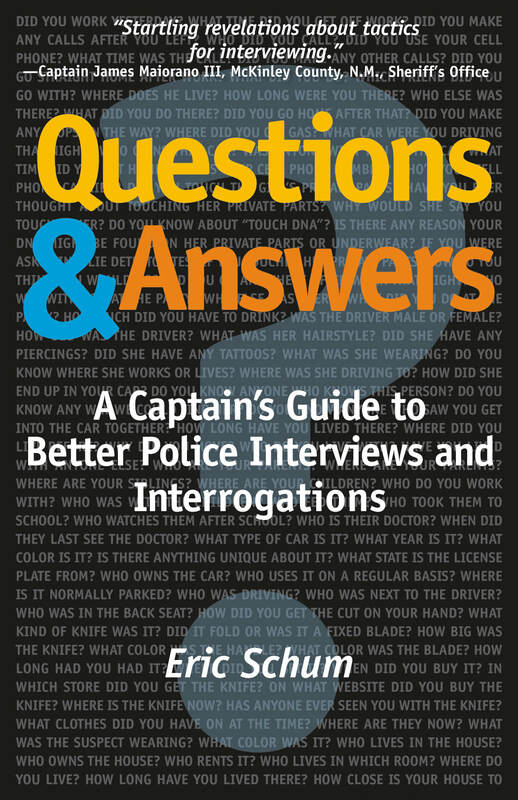 Eric Schum, a captain in the New Mexico State Police, has answers that work, based on his long and successful experience in law enforcement—yielding better results in a great many cases than the old standard practices used in many other departments. In this small, information-packed book, he lays out for his fellow officers ways of questioning witnesses and suspects that get results, respect their rights, and lead to fewer false confessions. This is a fact-filled book but also a personal one, in which Schum takes the reader through the thought processes he’s followed in one fascinating case after another, discussing lessons he’s learned, mistakes he’s made, techniques he’s mastered, and the ongoing struggles of a dedicated professional as he works to perfect a difficult craft. Eric Schum was born in Illinois and grew up in Albuquerque, New Mexico. He has been in the New Mexico State Police for fifteen years and currently serves as a captain. This is his first book.